Awhile back, I announced that I was working on a project related to this blog. Last week, I added the special alert to the top of this site announcing that a book was on the way. 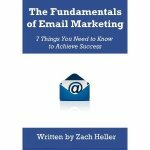 And today, I’m happy to announce that my first book, Fundamentals of Email Marketing, is in production and will be available soon. The book was inspired by some personal projects of mine. It’s short and sweet (approx. 40 pages), meant to serve as a guide for anyone who is new to email marketing, or someone looking for new ideas to improve their own campaign. The process has been exciting, and pieces of it still lie ahead. I'm working with Amazon to self-publish and make it available both as a download, for Kindle, and as a paperback. At this point, I hope to officially launch the book in July. I’ve created a signup page for anyone interested in learning more about the book. Just enter your name and email if you’d like more info, want to be alerted early when the book launches, would like to receive a free copy of the book to review, or if you’re just dying to know as much as possible about email marketing.